The lineup for Kinnection Campout 2016 has been announced! I am pleased to be performing for the second year in a row with some of my favorite artists! 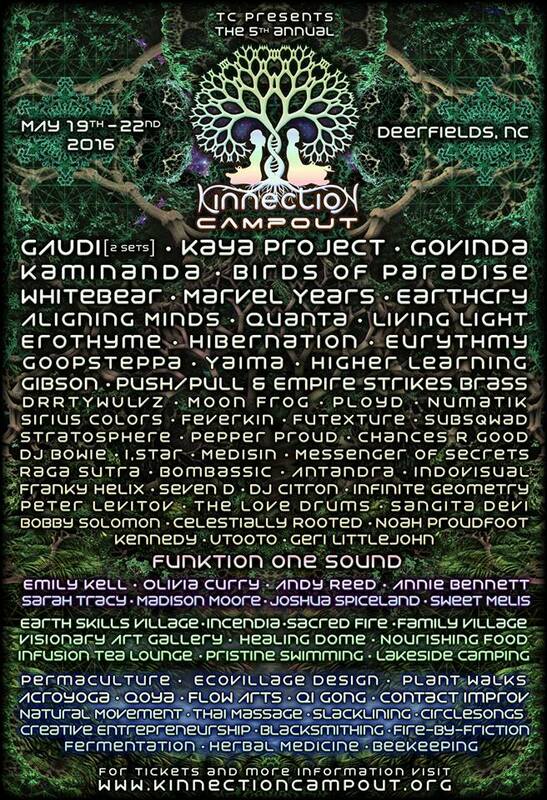 This Year’s lineup includes the likes of GAUDI, Kaya Project, Govinda Music, Kaminanda, Birds of Paradise, Whitebear, Marvel Years, EarthCry, Aligning Minds, Quanta, Living Light, Erothyme,Hibernation, Eurythmy, Goopsteppa, Yaima, Higher Learning, Tyler Gibson,Push/Pull, Empire Strikes Brass, DRRTYWULVZ, Moon Frog, Ployd, Numatik Music, Sirius Colors, Feverkin, Futexture, subsquad, Stratosphere, Pepper Proud, Chances R Good, DJ Bowie, I,Star, Medisin Messenger of Secrets, Raga Sutra, BomBassic, Antandra, IndoVisual, Franky Helix, Seven D, DJ Citron, Infinite Geometry, Peter Levitov, The Love Drums, Sangita Devi Kirtan, Bobby Solomon, Celestially Rooted, Noah Proudfoot, Kennedy, Utooto and Geri Littlejohn.